Specialising in the design, supply & installation of quality Kitchens, Bathrooms and Bedrooms in Harrogate. We also carry out any small building and joinery work, central heating installation, plastering, tiling, electrical work, internal softwood and hardwood doors, all certificated. Les Outhwaite Installations is a family company, established in 1978 and trading in the Harrogate area for over 30 years. We don’t have a fancy showroom – we come direct to you with samples and brochures, to ensure the kitchen, bathroom or bedroom you choose to own is exactly what you need. For all technical work, we only use: Part P Registered, National Inspection Council Approved Installers Fully Gas Safe registered and certified plumbing professionals. 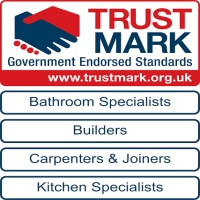 We are also fully Trustmark and Guild of Master Craftsmen approved. If you already have an estimate and a plan for your new kitchen, send it to us and we will do our best to beat any genuine quote.